The Earth’s North magnetic pole has been wandering at 10-year intervals from 1970 to 2020, as seen in this animation from the National Centers for Environmental Information. This post discusses solar and geologic magnetic pole swapping (not with each other of course) and the implications for humans. First the earth and later on the sun. Newsweek chose to report yesterday on earth’s meandering north pole as shown in the cool graphic above. That article (here) aims at sensational possible calamities, including high energy radiation, space particles, ozone depletion and electrical blackouts. A more sober assessment is provided by the conversation Why the Earth’s magnetic poles could be about to swap places – and how it would affect us By Phil Livermore and Jon Mound of U. Leeds.Excerpts below with my bolds. Since 2014, Swarm—a trio of satellites from the European Space Agency—has allowed researchers to study changes building at the Earth’s core, where the magnetic field is generated. Historically, Earth’s North and South magnetic poles have flipped every 200,000 or 300,000 years—except right now, they haven’t flipped successfully for about 780,000 years. But the planet’s magnetic field is at long last showing signs of shifting. The sun as a whole also has a “global” magnetic field, oriented more or less north-south. So we can think of the sun as a large N-S magnet, like our Earth, but with smaller variously (but not randomly) oriented and continually evolving mini-magnets distributed over its photosphere (visible surface) and throughout its corona (extended atmosphere). However, unlike our Earth, the sun’s large scale magnetic field flips over on a regular basis, roughly every 11 years. (Actually, Earth’s flips too, very irregularly. The last time was 780,000 years ago. But that’s another story.) Solar magnetic reversals occur close to solar maximum, when the number of sunspots is near its peak, though it is often a gradual process, taking up to 18 months. 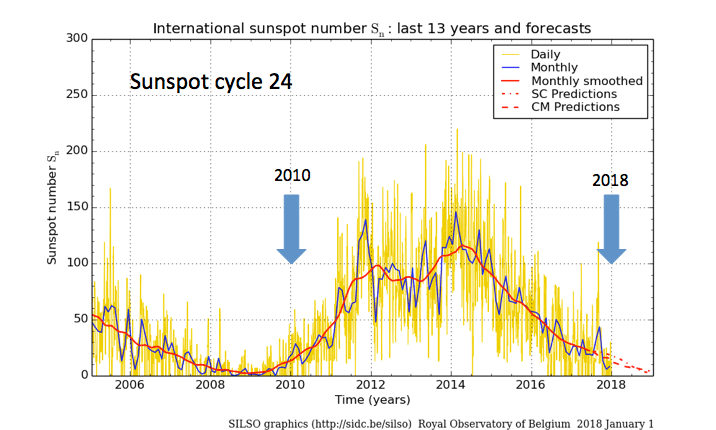 Euan Mearns considers the implications at Energy Matters The Death of Sunspot Cycle 24, Huge Snow and Record Cold Excerpts below with my bolds. So what is going on? We’ve been told by climate scientists that snow would become a thing of the past. We’ve also been told that global warming might lead to more snow and less snow. 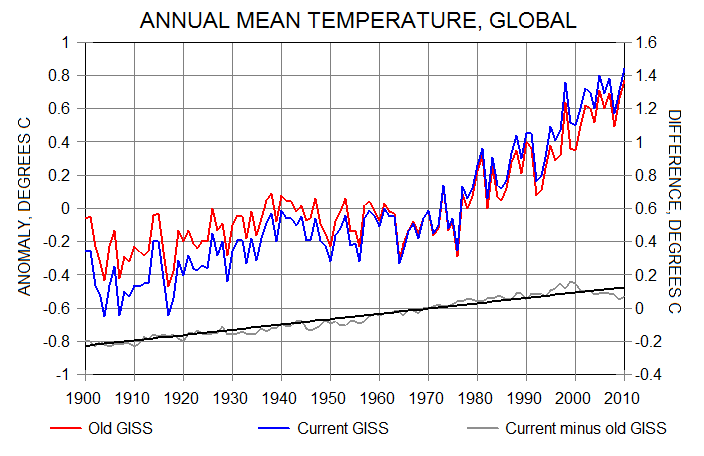 And we’ve been told that warming might even lead to cooling. The competing theory to the CO2 greenhouse is that the Sun has a prominent role in modulating Earth’s climate that was so eloquently described by Phil Chapman in his post earlier this week. This theory simply observes a strong connection between a weak solar wind (that is expressed by low sunspot numbers) and cold, snowy winters in the N hemisphere. Uniquely, most of those who argue for a strong solar influence also acknowledge the overprint of anthropogenic CO2. The IPCC effectively sets the Sun to zero. The Sun is entering a grand solar minimum already christened the Eddy Minimum by the solar physics community. Figure 2 It is crucial to look at the baseline closely that in 2009 actually touched zero for months on end. This is not normal for the low point of the cycle. Figure 3 shows how cycle 24 was feeble compared with recent cycles. And it looks like it will have a duration of ~10 years (2009-2019) which as the low end of the normal range which is 9 to 14 years with mean of 11 years. 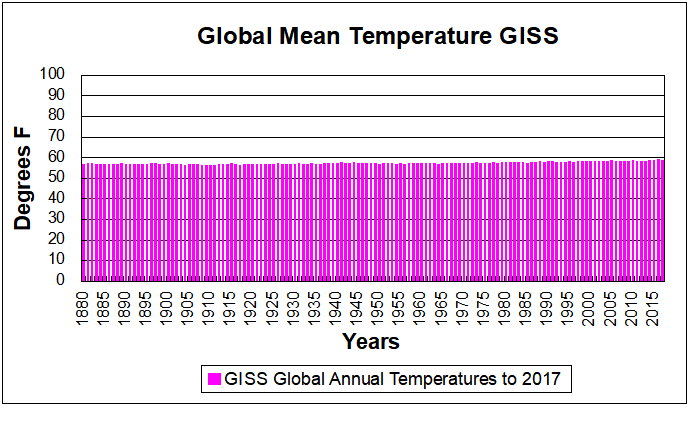 Chart adapted from SIDC is dated 1 January 2018. Cosmic rays are deflected by BOTH the Sun’s and Earth’s magnetic fields and there may also be variations in the incident cosmic ray background. Cosmogenic isotope variations, therefore, do not only record variations in solar activity. This has two significant implications for me: 1) when I have looked into cosmogenic isotopes in the past I have been perplexed by the fact that in parts you see a wonderful coherence with “climate” (T≠climate) while else where, the relationship breaks down, and 2) my recent focus has been on variations in spectrum from the Sun (which may still be important) but to the extent that the Laschamp event (Earth’s magnetic field) may also be implicated in climate change then the emphasis needs to shift to cosmic rays themselves i.e. what Svensmark has been saying for years. For readers not familiar with Earth’s magnetic field. It periodically flips but on a time-scale of millions of years. The N pole moves to the S pole and in the process of doing so the magnetic field strength collapses as evidenced by “Figure 7” in Phil’s post. The last time this happened was during the Laschamp event ~ 41,000 years ago. There was a full but short lived reversal, but the Earth’s magnetic field did collapse. Since we absolutely know (don’t we?) that the interglacial to glacial transitions of the current ice age are caused by Milankovitch forcing, the usual interpretation is that there must be some unknown mechanism by which changes in the orbit of the Earth and/or the tilt of the polar axis affect the geodynamo, triggering the excursions. For decades to centuries, Earth’s N magnetic pole was pretty well fixed to a point in northern Canada. Not much in the news, but it has recently begun to migrate, quite rapidly. I have really struggled with what to discuss in today’s Impacts section and in the end decided to focus on a feature that gets no respect and to elaborate on last week’s discussion. One big problem has been large model uncertainty and lack of reliable guidance. I think it should be obvious to anyone reading the blog that I am focused on the behavior of the stratospheric polar vortex (SPV) and using variability in that behavior to anticipate large scale climate anomalies across the Northern Hemisphere (NH) on the timescale of days to weeks and even months. The weather models (I spend most of my time analyzing the global forecast system (GFS) but I do not think that it is limited to the GFS) have been predicting some wild and highly anomalous behavior in the SPV. First the GFS was predicting a SPV displacement into North America (why this is highly anomalous is a good question and not something that I fully understand). Then the GFS predicted a strong warming in the polar stratosphere centered over Scandinavia of the magnitude that is only observed over East Asia and Alaska. The GFS has mostly backed off of these forecasts or at least predicting events of much smaller magnitudes (though it is back in the 12z run). And looking back at the behavior of the SPV for the winter it can be summed up as unremarkable in many ways. My sense is that the SPV has been stronger than normal for the winter characterized a mostly positive stratospheric AO and cold/below normal PCHS in the stratosphere. Based on that alone one would expect an overwhelmingly mild winter across the NH mid-latitudes. However that would not be an accurate description of the winter. But in the atmosphere you cannot have low pressure without high pressure. And as we head into the final third or half of winter, I don’t think that one can understand or explain this winter’s temperature variability without focusing on anomalous high pressure in the polar stratosphere. So in the end I have decided to discuss what I like to call the “Rodney Dangerfield” of weather- high pressure because it doesn’t seem to get the respect it deserves certainly compared to low pressure. My passion for weather began with my love for snow and I couldn’t wait for the next snow opportunity. 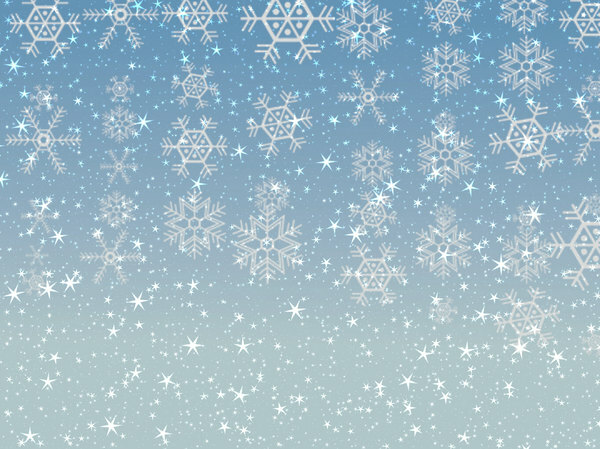 I grew up in New York City (NYC) where it snows every winter but to get a good snowfall is always challenging and predicted snowfalls more often than not did not materialize because of too much dry air or too much warm air or the storm being too far out to sea…. It became apparent to me having an area of low pressure passing near NYC rarely translated to a snowstorm. Instead a better predictor of snowfall was the position of high pressure. If Arctic high pressure settled to the north of NYC across Quebec or even Northern New England the likelihood of snowfall greatly increased despite model predicted storm tracks. With high pressure entrenched to the north, good things (as far as snow falling in NYC) happened. So even though meteorologists like to focus on storms and low pressure, in my opinion the key player in whether it would snow or not was the high pressure. This recognition of the importance of high pressure that began with my passion for weather followed me to my studies. On the regional scale of snowfall in NYC it was the storms that got all the attention and high pressure was neglected (at least that was my impression). Similarly when I began studying winter climate variability on a large scale again my impression was that the focus was on the two semi-permanent large scale low pressures the Icelandic and the Aleutian lows. 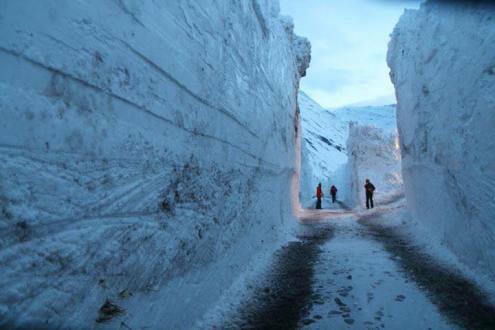 There was a third semi-permanent feature that seemed to get scant attention – the Siberian high. When my own research demonstrated a relationship between Eurasian snow cover and winter climate including in the Eastern US to me the obvious link or pathway was the Siberian high. It took many years and many studies to come to the understanding I have today (which remains incomplete) but it is my opinion that the Siberian high is the single most important large scale synoptic feature that influences the variability of the SPV (other climate scientists may disagree with me). My own empirical observations are that when the Siberian high is shifted to the northwest over the Urals and Scandinavia region, this will inevitably produce increased energy transfer from the troposphere to the stratosphere and more often than not disrupt the SPV. The likelihood of a disruption will increase if the Ural blocking is coupled with downstream troughing across East Asia and the North Pacific or a deeper than normal Aleutian low. Through the blog I advocate for the importance of SPV variability on sensible weather and whether the SPV is “still” or “disrupted” can have important and large implications for surface weather. As I discussed last week, from the blog it has become obvious to me thinking of the SPV as weak and strong only, or even compositing based on the absence or existence of zonal wind reversals at 60°N and 10 hPa was overly simplistic and probably missed most of the coupling with the troposphere. Instead the position of the SPV and the flow around the SPV were important regardless of the speed of the zonal winds at 60°N and 10 hPa. But this winter makes me believe that it might even be more nuanced than even the wind flow around the SPV. The precursor to the historic cold in the Eastern US in late December and early January was a Canadian warming/high pressure in the polar stratosphere the third week of December. But as it turns out the most impressive cold anomalies during the month of January are not in North America but Asia. A second warming/high pressure near Eastern Siberia in mid-January accompanied near record cold in Siberia and large parts of Asia. Figure 12. (a) Forecasted 10 mb geopotential heights (dam; contours) and temperature anomalies (°C; shading) across the Northern Hemisphere for 30 January – 3 February 2018. (b) Same as (a) except averaged from 4 – 8 February 2018. The forecasts are from the 29 January 2018 00z GFS ensemble. Now a third warming/high pressure predicted back in the western hemisphere across Alaska and Northwest Canada is again a precursor for a return of cold temperatures to the Eastern US and Eastern Canada starting this week (see Figure 12). The location of high pressure/heating in the polar stratosphere is the best explanation that I have for the placement and timing of the dominant cold anomalies across the NH. I have a hard time making the same explanation based on the location of the SPV or the flow around the SPV. Of course my reasoning is overly simplistic and the resultant weather anomalies are not limited to one factor or influence but rather a combination of many different influences or forcings. As I discussed in last week’s blog an alternative explanation being offered for the return of cold weather to eastern North America is the Madden Julian Oscillation (MJO). Originally the models and meteorologists relying on MJO forcing predicted a mild first half of February and a colder second half of February. That forecast has changed mostly to a cold February from start to finish. I don’t think that change in the forecast can be ignored or glossed over with the change in timing as an inconsequential detail. The forecast for this week across the US is western ridge and warm with eastern trough and cold, though admittedly the cold is not overly impressive. Based purely on the MJO the next two weeks should feature a cold Western US and a warm Eastern US opposite of the most recent forecasts. If it is cold in the Eastern US over the next two weeks it is not because of the MJO but in spite of the MJO. Currently the models are not quite sure if the MJO will make it to phase 8 but that phase is related to a warm Western US and cold Eastern US. If the cold persists until the third week of February then the MJO forcing could constructively interfere with the already cold pattern. If the early arrival of the cold cannot be attributed to MJO forcing then what could be the reason? My explanation is something that I have discussed many times before – the models fail to correctly “propagate down” circulation anomalies from the stratosphere to the troposphere until the changes can’t be ignored. At longer leads the models did not correctly predict the return of Alaska ridging related to SPV variability but corrected at shorter leads. 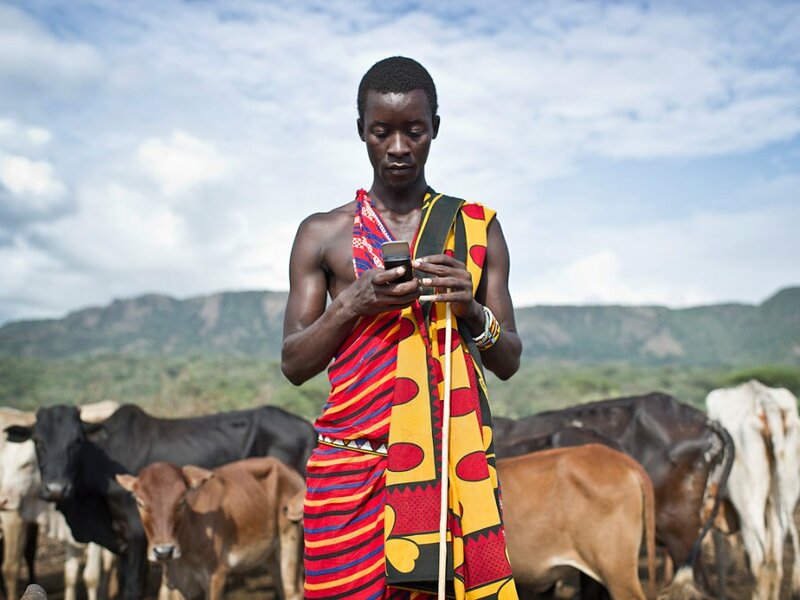 Masai warrior with cell phone. These figures include not only the energy used directly in households, but also energy used in transportation, manufacturing, power production and other sectors. Such a calculation makes more sense than looking at household energy consumption alone, because people consume much more energy outside their homes, for example through the products that they buy. I don’t share the author’s fear of climate change which does permeate his discussion of the issues in raising up impoverished populations. De Dekker goes on: However, while it’s recognised that part of the global population is using not enough energy, there is not the same discussion of people who are using too much energy. Nevertheless, solving the tension between demand reduction and energy poverty can only happen if those who use ‘too much’ reduce their energy use. Bringing the rest of the world up to the living standards and energy use of rich countries – the implicit aim of ‘human development’ – would solve the problem of inequality, but it’s not compatible with the environmental problems we face. However, although distributing energy use equally across the global population may sound fair, in fact the opposite is true. The amount of energy that people ‘need’ is not only up to them. It also depends on the climate (people living in cold climates will require more energy for heating than those living in warm climates), the culture (the use of air conditioning in the US versus the siesta in Southern Europe), and the infrastructure (cities that lack public transport and cycling facilities force people into cars). To account for all these differences, most researchers approach the diagnosis of energy poverty by focusing on ‘energy services’, not on a particular level of energy use. People do not demand energy or fuel per se – what they need are the services that energy provides. For example, when it comes to lighting, people do not need a particular amount of energy but an adequate level of light depending on what they are doing. Some energy poverty indicators go one step further still. They don’t specify energy services, but basic human needs or capabilities (depending on the theory). In these modes, basic needs or capabilities are considered to be universal, but the means to achieve them are considered geographically and culturally specific. The focus of these needs-based indicators is on measuring the conditions of human well-being, rather than on specifying the requirements for achieving these outcomes. Examples of human basic needs are clean water and nutrition, shelter, thermal comfort, a non-threatening environment, significant relationships, education and healthcare. Basic needs are considered to be universal, objective, non-substitutable (for example, insufficient food intake cannot be solved by increasing dwelling space, or the other way around), cross-generational (the basic needs of future generations of humans will be the same as those of present generations), and satiable (the contribution of water, calories, or dwelling space to basic needs can be satiated). This means that thresholds can be conceived where serious harm is avoided. ‘Needs’ can be distinguished from ‘wants’, which are subjective, evolving over time, individual, substitutable and insatiable. Focusing on basic needs in this way makes it possible to distinguish between ‘necessities’ and ‘luxuries’, and to argue that human needs, present and future, trump present and future ‘wants’. The author goes on to discuss energy demand reductions from efficiencies and substitutions, but cannot get around his fundamental dilemma: Needs are universal, objective, non-substitutable, cross-generational, and satiable. Wants are subjective, evolving over time, individual, substitutable and insatiable. Some of the text reminded me of soviet era Romania. At Ceaușescu’s initiative in 1981, a “Rational Eating Programme” began, being a “scientific plan” for limiting the calorie intake for the Romanians, claiming that the Romanians were eating too much. It tried to reduce the calorie intake by 9-15 percent to 2,800-3,000 calories per day. In December 1983, a new dietary programme for 1984 set even lower allowances. That “austerity program” destroyed the economy, bringing down the ruler and regime. People and their societies are dynamic, not static, as Matthew Kahn keeps reminding us. When their labor is enhanced with energy from fossil fuels, people are healthier, more productive and inventive in seeking, finding and using natural resources. Club of Rome’s notion of limits to growth failed to understand human resources, and today’s followers are equally blind. 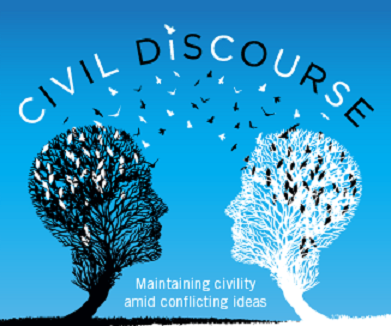 A previous post described Civil Discourse (here) tactics regarding controversial subjects like global warming/climate change. Another post (here) noted that contemporary leftists advocate through social rather than political persuasion, and have taken over most of the cultural institutions in pursuing their agenda. A recent BBC interview with Jordan Peterson demonstrates exactly how an opinionated media bully engages in coercive rather than civil discourse. The analysis is provided by Conor Friedersdorf in the Atlantic Why Can’t People Hear What Jordan Peterson Is Saying? A British broadcaster doggedly tried to put words into the academic’s mouth. The whole article is revealing and worth reading. 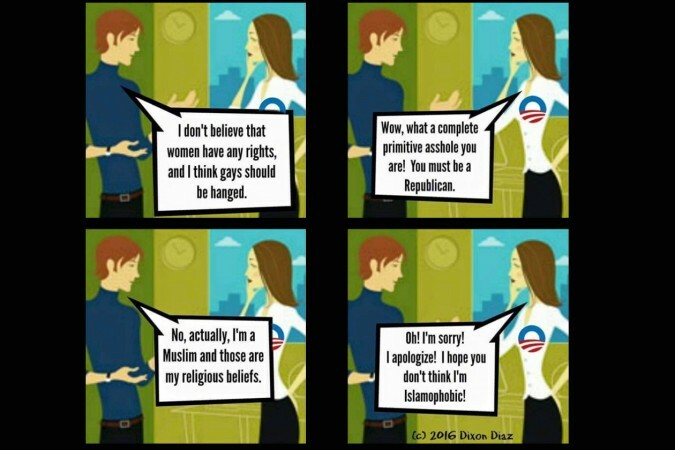 Here I provide a few of many examples of attempted social coercion posing as an interview. Excerpts below with my bolds. Update: A Post interview conversation with Peterson illuminates the dynamics and shows how in the aftermath social justice warriors morph into victims and martyrs. Satellite image of sea surface temperature in the Gulf Stream. Open image in new tab if animation is not working. Surface-ocean circulation in the northern Atlantic Ocean influences Northern Hemisphere climate. Century-scale circulation variability in the Atlantic Ocean, however, is poorly constrained due to insufficiently-resolved paleoceanographic records. Here we present a replicated reconstruction of sea-surface temperature and salinity from a site sensitive to North Atlantic circulation in the Gulf of Mexico which reveals pronounced centennial-scale variability over the late Holocene. We find significant correlations on these timescales between salinity changes in the Atlantic, a diagnostic parameter of circulation, and widespread precipitation anomalies using three approaches: multiproxy synthesis, observational datasets, and a transient simulation. Our results demonstrate links between centennial changes in northern Atlantic surface-circulation and hydroclimate changes in the adjacent continents over the late Holocene. 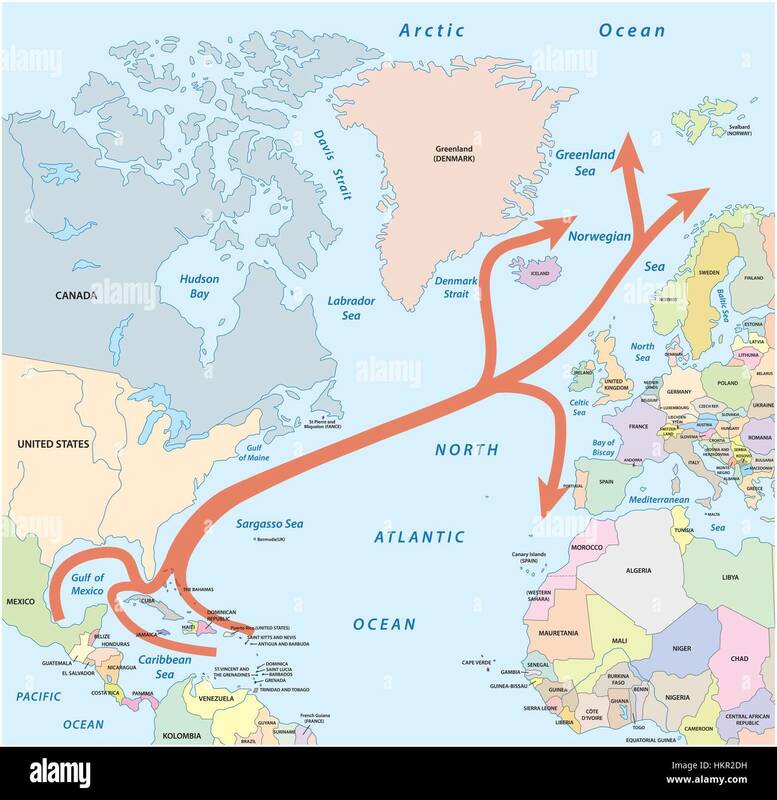 Notably, our findings reveal that weakened surface-circulation in the Atlantic Ocean was concomitant with well-documented rainfall anomalies in the Western Hemisphere during the Little Ice Age. Here we address this shortfall and reconstruct SST and SSS variability over the last 4,400 years using foraminiferal geochemistry in marine sediments cored from the Garrison Basin (26°40.19′N,93°55.22′W, (purple circle in diagrams above), northern GOM. We make inferences about past changes in Loop Current strength by identifying time periods in our reconstruction where synchronous decreases in SST and SSS are interpreted as periods with a weaker Loop Current due to reduced eddy penetration over that period and vice versa. Thus, we assess the spatial heterogeneity of the putative reduction of Atlantic surface-ocean circulation and furthermore, with multiproxy synthesis, correlation analysis, and model-data comparison, we document linkages between changes in Atlantic surface-circulation and Western Hemisphere hydroclimate anomalies. Our findings reveal that regardless of whether changes in the AMOC and deepwater formation occurred or not, weakened surface-circulation prevailed in the northern Atlantic basin during the Little Ice Age and was concomitant with widespread and well-documented precipitation anomalies over the adjacent continents. Figure 2. Garrison Basin multicore reconstructions and corresponding stacked records. Individual core Mg/Ca (mmol/mol) and δ18Oc data (‰, VPDB), and δ18Osw (‰, VSMOW) and SST (°C) reconstructions (blue–MCA, red- MCB, yellow–MCC) plotted with median and 68% uncertainty envelope incorporating age, analytical, calibration, and sampling errors (a-d) along with corresponding median stacked records with 68% and 95% confidence bounds (e-h). Diamonds in a and e indicate stratigraphic points sampled for radiocarbon. Gray histogram in g is the probability distribution for a changepoint in the δ18Osw time series. Orange circle in g is the mean of available δ18Osw measurements in the GOM and orange line in h is observed monthly mean SST with uncertainty envelope calculated using a Monte Carlo procedure that simulates foraminiferal sampling protocol. Purple line in h is the 100-year running correlation between SST and δ18Osw with corresponding uncertainty with shaded boxes indicating correlations with r > 0.7 (p < 0.001), which is the basis for identifying time periods where Loop Current and associated processes are relevant. We analyzed long-term (~multidecadal) observations in instrumental datasets to place our reconstructions into a global climatic context. The HadISST data set22 documents 0.4–0.7 °C of multidecadal SST variability in the northern GOM over the last century. On these multidecadal timescales, SSTs in the northern GOM correlate highly with SST in the Loop Current region. 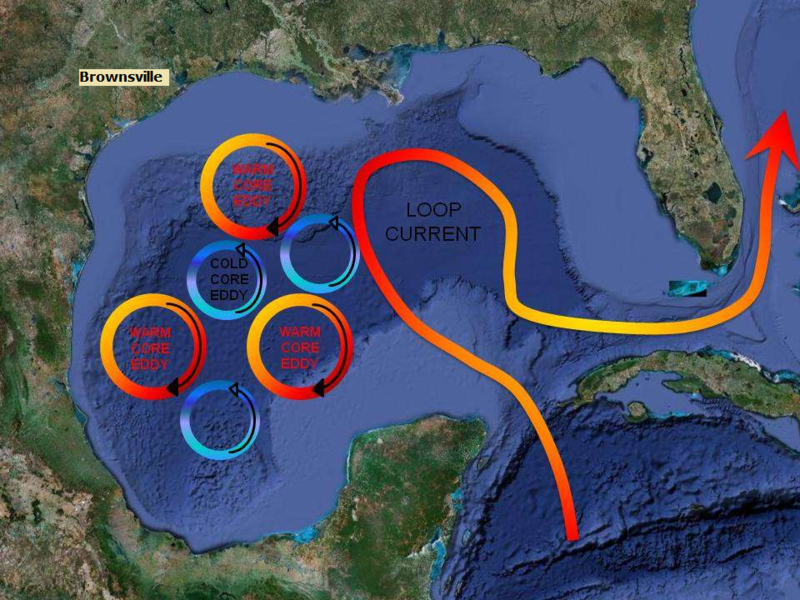 In particular, long-term SST variability here is impacted by the Loop Current through its eddy shedding processes which are coupled to the strength of transport from the Yucatan Straits through the Florida Straits: if Loop Current transport is anomalously low, then northern GOM SSTs are anomalously cooler due to decreased eddy penetration and the opposite is the case when Loop Current transport is anomalously higher, i.e., northern GOM experiences anomalously warmer conditions. Furthermore, the Loop Current, sitting upstream of where the Gulf Stream originates, correlates highly with SST associated with regions encompassing downstream currents. In summary, correlation analysis using SSS datasets provides a blueprint for investigating circulation variability and transport into the North Atlantic Ocean. We also examine long-term correlations between SSS in the northern GOM and mean annual rainfall in the continents adjacent to the Atlantic Basin using rain-gauge precipitation datasets (Fig. 1). Most notably, GOM SSS is anticorrelated with southern North American rainfall (i.e., fresher GOM with wetter southern North America) and is positively correlated with rainfall in West Africa, northern South America, and the southeast United States (|r| > 0.6, p < 0.01). These inferences demonstrate a correspondence between Western Hemisphere hydroclimate and Atlantic Ocean circulation on multidecadal timescales. 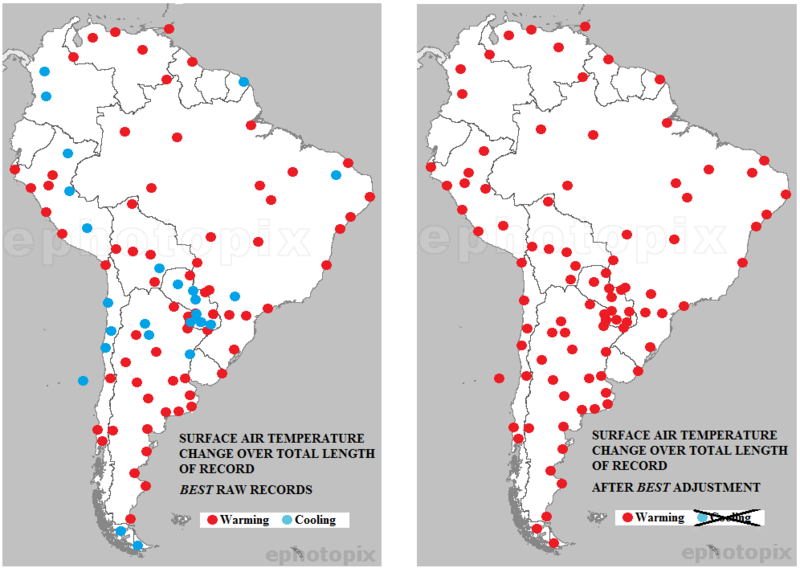 In comparing available reconstructions of precipitation during the LIA with our correlation map (Fig. 1), we find remarkable agreement with the proxy record: tree-ring-based PDSI reconstructions in southern North America, and stalagmites from southern Mexico43 and Peru44 capture a wetter LIA compared to modern times whereas a lake record from southern Ghana, titanium percent in Cariaco Basin sediments, and reconstructed PDSI in the southeast U. S. indicate dry LIA conditions. Additional proxy records appear to corroborate this observation as well (brown and green squares in Fig. 1; Supplementary Table 1). These mean state changes during the LIA all appear to be coeval with an anomalously fresher northern Atlantic Ocean, indicative of weakened Gulf Stream strength and reduced surface-ocean circulation. The transient simulation indicates that a weaker gyre, increased sea-ice cover, and reduced interhemispheric heat transport causes the ITCZ to shift southward and produces anomalous rainfall over the Americas. 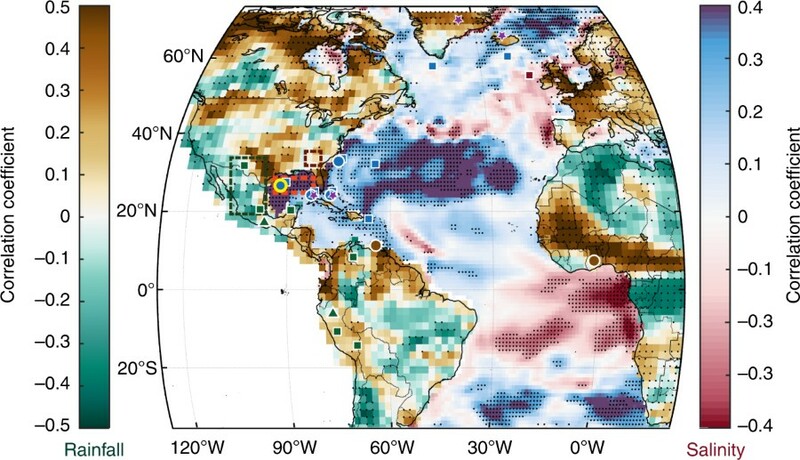 This state of weakened AMOC, observed in millennial-scale and glacial paleo-studies, with cool and fresh north Atlantic anomalies and a southward ITCZ, can induce increased rainfall over the southwest US via atmospheric teleconnections associated with the North Atlantic subtropical high overlying the gyre. Despite this southward shift, positive SSS anomalies can occur in the tropical Atlantic (and negative anomalies in the northern Atlantic) due to reduced freshwater input resulting from decreased rainfall in the Amazon and West African regions. Eventually, the tropical positive salinity anomaly in the southern Atlantic propagates northward, thereby strengthening meridional oceanic transport and providing the delayed negative feedback. Though the length of the instrumental record limits us from directly analyzing centennial-scale correlations, there is theoretical and modeling evidence to implicate similar ocean-atmosphere processes on multidecadal and centennial timescales. Both model and observational analyses reveal a dipolar structure in Atlantic Ocean SSS that is consistent with the LIA proxies and thereby supports our hypothesis linking meridional salt transport and tropical rainfall. Both analyses also display similarities in continental precipitation patterns over western Africa, northern South America, and the southwestern United States, which are also consistent with the LIA hydroclimate proxies. The broad agreement between the analyses supports similar ocean-atmosphere processes on multidecadal-to-centennial timescales, and provides additional evidence of a robust century-scale link between circulation changes in the Atlantic basin and precipitation in the adjacent continents. 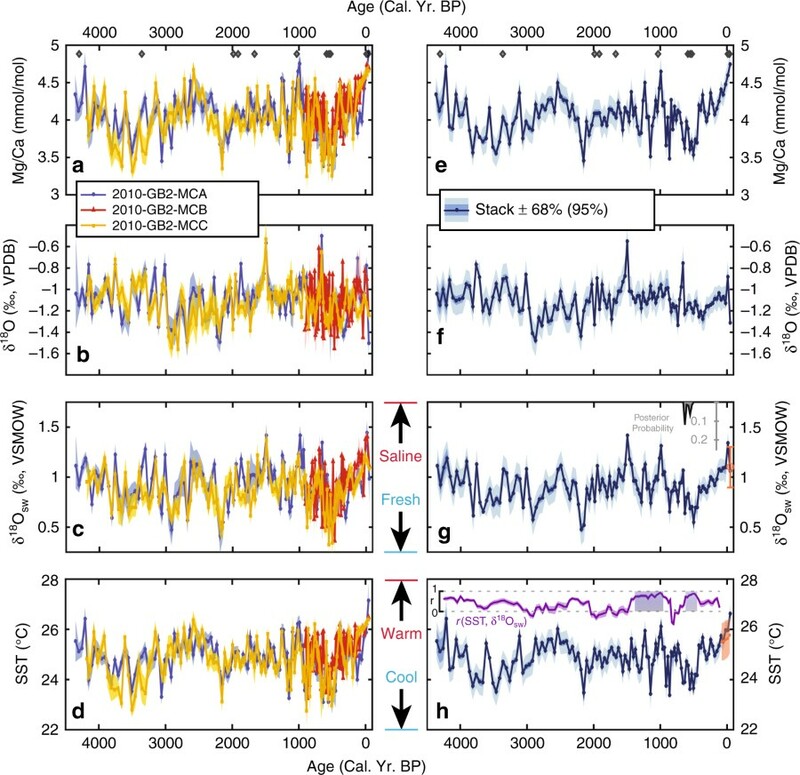 Regardless of the specific physical mechanism concerning the onset of the LIA, and whether AMOC changes were linked with circulation changes in the surface ocean, we hypothesize that the reported oscillatory feedback on centennial-time scales involving the surface-circulation in the Atlantic Ocean and Western Hemisphere hydroclimate played an important role in last millennium climate variability and perhaps, over the late Holocene. Writing in the Atlantic, Charles Mann raises an important question: Can Planet Earth Feed 10 Billion People? Humanity has 30 years to find out. Excerpts below with my images and bolds. In the botanical equivalent of a moonshot, scientists from around the world are trying to convert rice into a C4 plant—one that would grow faster, require less water and fertilizer, and produce more grain. The scope and audacity of the project are hard to overstate. Rice is the world’s most important foodstuff, the staple crop for more than half the global population, a food so embedded in Asian culture that the words rice and meal are variants of each other in both Chinese and Japanese. Nobody can predict with confidence how much more rice farmers will need to grow by 2050, but estimates range up to a 40 percent rise, driven by both increasing population numbers and increasing affluence, which permits formerly poor people to switch to rice from less prestigious staples such as millet and sweet potato. Funded largely by the Bill & Melinda Gates Foundation, the C4 Rice Consortium is the world’s most ambitious genetic-engineering project. But the term genetic engineering does not capture the project’s scope. 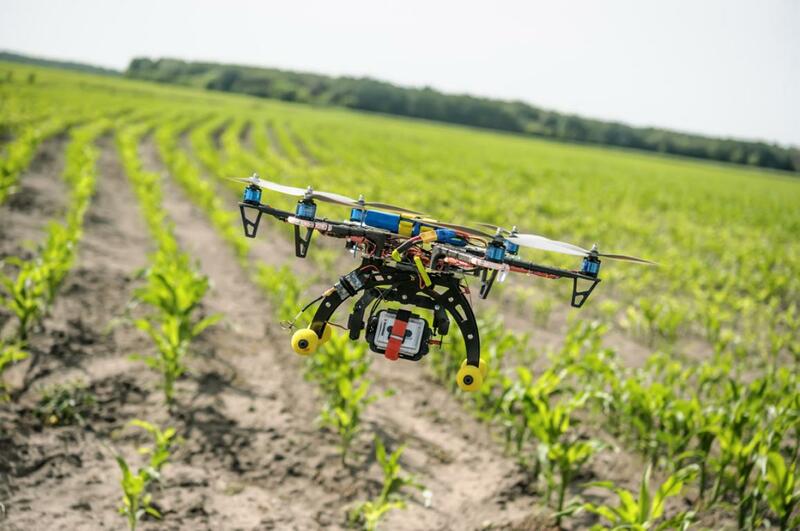 The genetic engineering that appears in news reports typically involves big companies sticking individual packets of genetic material, usually from a foreign species, into a crop. The paradigmatic example is Monsanto’s Roundup Ready soybean, which contains a snippet of DNA from a bacterium that was found in a Louisiana waste pond. 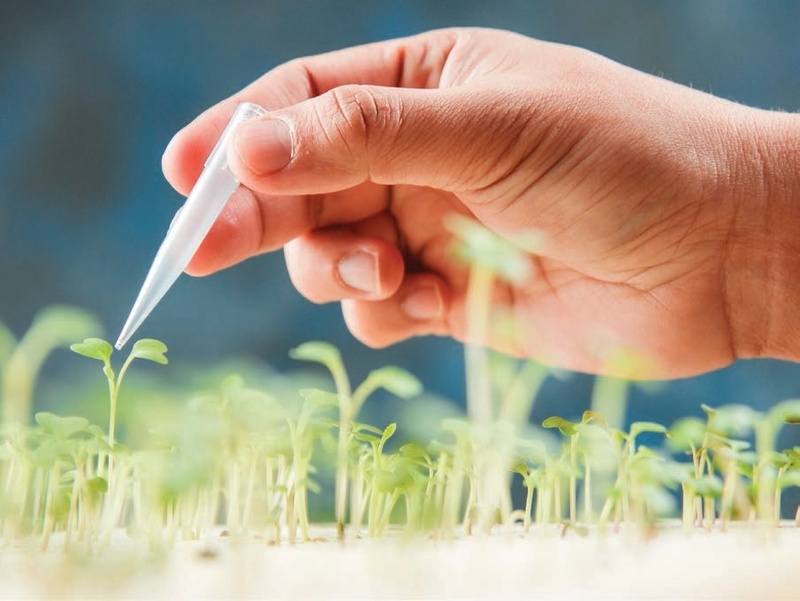 That snippet makes the plant assemble a chemical compound in its leaves and stems that blocks the effects of Roundup, Monsanto’s widely used herbicide. The foreign gene lets farmers spray Roundup on their soy fields, killing weeds but leaving the crop unharmed. Except for making a single tasteless, odorless, nontoxic protein, Roundup Ready soybeans are otherwise identical to ordinary soybeans. 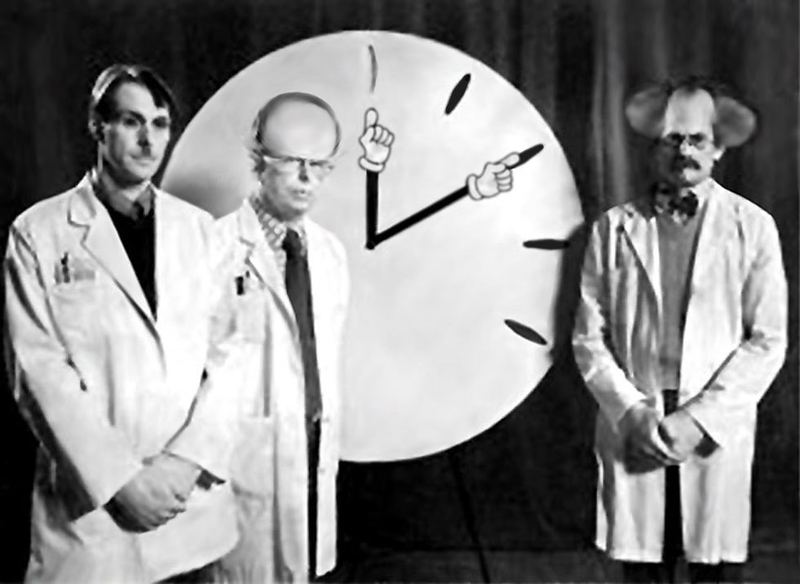 Doomsday was predicted but failed to happen at midnight. New York city signed up for “Me Too” commitment to Paris Accord, and the city’s pensioners are paying the price as their retirement funds suffer from virtue signaling divestment from oil companies. Jeff Patch writes in Real Clear Policy End the Political Games With Public Pensions Excerpts below with my bolds. There’s a link on New York City Comptroller Scott Stringer’s website to an outline of his office’s Powers and Duties Under New York State Law. The 159-page overview covers an extensive spectrum of legal responsibilities, ranging from arts and cultural affairs to worker compensation. 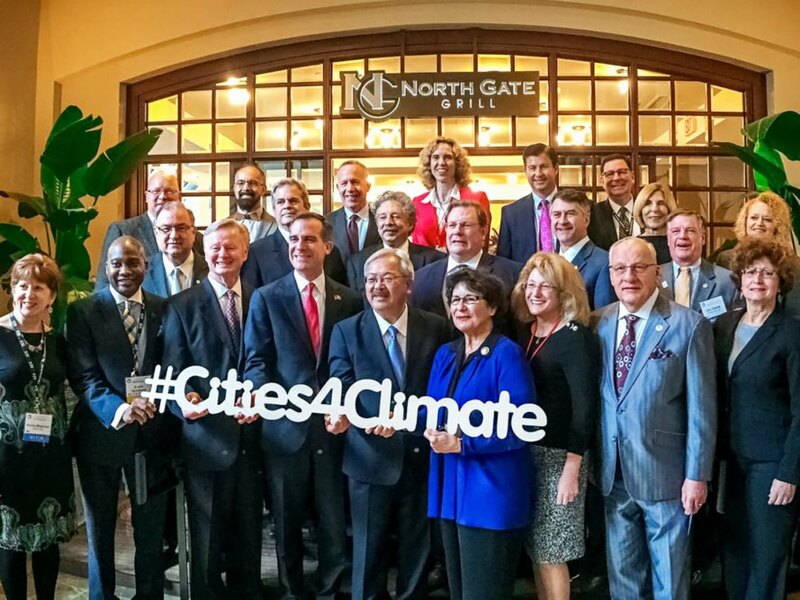 Nowhere does the list reference shareholder activism, directing city environmental policies, or — for that matter — leveraging the $190 billion in pension fund assets his office stewards to pursue a political agenda. And yet that’s exactly what Mr. Stringer is doing. The professional investment managers of the city’s five public-sector pension funds, their board members, and Stringer himself are all exploiting their positions as custodians of the retirement savings of the city’s workers to promote their own political objectives. Politics seems to pervade every action of the city comptroller’s office, which just last month announced a plan to divest pension holdings from fossil-fuel interests, regardless of the impact on financial performance. A new report from the American Council for Capital Formation sheds light on how such political machinations have impacted New York’s public pension funds, highlighting the price residents pay for their leaders’ political predilections. Specifically, the report finds that nearly $1 of every $5 of personal income taxes the city collects go to paying down the pension system’s liabilities. Meanwhile, the liabilities continue to grow, with nearly $10 billion from the City’s proposed 2018 budget needed to cover a pension funding shortfall that ranges between $65 billion and $142 billion. As the person responsible for the management of those funds, one might expect Mr. Stringer to focus on making prudent investments. Fiscal diligence should be the top priority of any comptroller’s office. Instead, Stringer and his staff have continued using public monies as a political tool to pressure social change in corporate boardrooms. For instance, last year, his office launched the second phase of a project aimed at pressuring public companies on various social issues, including his Boardroom Accountability Project 2.0, which pushes companies to disclose demographics on members, including their sexual orientation. Over the course of 2017, New York City Comptroller’s Office has become one of the nation’s most aggressive sponsors of activist shareholder proposals, submitting close to 100 measures, including a new initiative to divest public funds entirely from fossil fuels by 2020. The ACCF report uncovers numerous instances of fiduciary irresponsibility. It reveals how fund managers have chosen to systematically increase investments in the Developed Environmental Activist stocks, despite the classes continued underperformance against the rest of the fund. (Those assets now make up 12 percent of the total fund.) And it details how Stringer prioritizes headline-grabbing political appearances ahead of resolving the under-performance of his funds. Perhaps most concerning point is that a majority of Stringer’s constituents — the teachers, nurses, policemen, and firefighters who dutifully pay into public pension funds every month — remain oblivious to this emerging crisis. Last week, a separate study released by the Spectrum Group revealed that 80 percent of the city’s current and former employees were unaware that their pensions were not fully funded. Two-thirds of all respondents said they wanted their funds’ managers to concentrate on maximizing their returns. Taken together, these reports make two points abundantly clear. First, there is a very real disconnect between the objectives of the people who own the funds and their professional managers. Second, this disconnect has consequences not just pension fund members, but also for taxpayers across the city. In short, everybody loses — except Stringer and his political supporters. The city comptroller has a duty to put the financial interests of taxpayers and public employees above his narrow political ambitions. If Mr. Stringer wants to set social policy, he should run for city or state office instead. Until then, he should focus on safeguarding the future of his constituents’ pension funds. The issue of global warming/climate change has been used to polarize populations for political leverage. People like myself who are skeptical of alarmist claims find it difficult to engage with others whose minds are made up with or without a factual basis. 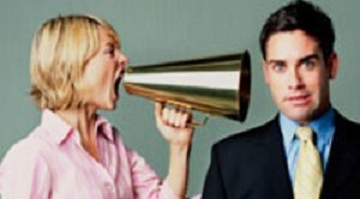 In a recent email Alex Epstein gives some good advice how to talk about energy and climate. At the end I provide links to other material from Alex supporting his principle message regarding human benefits from using fossil fuels. Text below is his email with my bolds. Unless I have some specific reason for wanting to have a long conversation I like to keep my conversations short, with the end goal of getting the other person to consume some high-impact resource. One way to make this even more effective is to offer to email/mail the person a resource. Then you’ll have their contact info and can follow up in a few weeks. Probably better. You’re probably not resistant. You may well be intrigued. 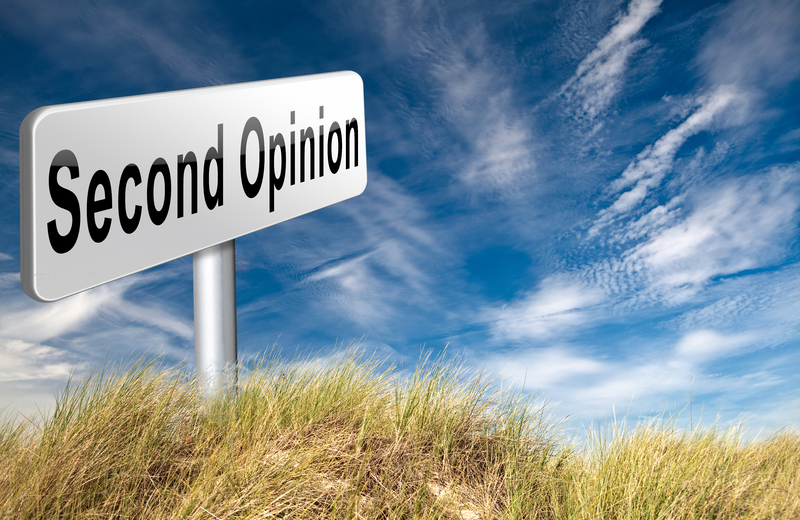 And you can’t disagree with me–because I didn’t tell you what to think, I told you my opinion story. I respected your independence. You can use opinion stories for anything, no matter how controversial. I like to have an opinion story for every controversial opinion I hold. I’ve had the same experience, too! On many issues. Often in conversation the phenomenon of conflicting factual claims on an issue—such as the impact of solar and wind on Germany’s economy—leads to an impasse. One way to deal with this is to focus on establishing an explicit framework, with human flourishing (not minimum impact) as the goal and full context analysis (not bias and sloppiness) as the process. Most disputes stem from conflicting frameworks, not conflicting facts. And if you offer a compelling framework you’ll be more trustworthy on the facts. That said, here’s a tactic I discovered a few years ago to make certain factual points much more persuasive in the moment..
I’ll start with how I discovered it. I was walking through the Irvine Spectrum mall with a good friend when we ran into two young women working to promote Greenpeace. My friend found one of the women attractive and said he wanted to talk to her. I thought, given my experiences with (paid) Greenpeace activists, that this was unlikely to be an edifying experience, and encouraged him to instead record a conversation between me and one of the women. Unfortunately for posterity, I was unpersuasive and what follows was never recorded. I decided to talk to the other Greenpeace woman. She quickly started “educating” me on how Germany was successfully running on solar and wind. Greenpeace: “I don’t know,” followed by—very rare for a Greenpeace activist—having nothing to say. Had this been a normal person I am confident the live confirmation of the surprising fact would have made a lasting impression. I think this tactic works best for news stories about surprising facts. Vs. an opinion story about some issue of analysis, like what Germany’s GDP is. Alex Epstein is among those who demonstrate from public information sources comparisons between societies who use carbon fuels extensively and those who do not. The contrast is remarkable: Societies with fossil fuels have citizens who are healthier, live longer, have higher standards of living, and enjoy cleaner air and drinking water, to boot. Not only do healthier, more mobile people create social wealth and prosperity, carbon-based energy is heavily taxed by every society that uses it. Those added government revenues go (at least some of it) into the social welfare of the citizenry. By almost any measure, carbon-based energy makes the difference between developed and underdeveloped populations. Maslow’s hierarchy of human needs updated. Contemporary style-setters display great nostalgia for pre-industrial ways of living, without ever having to subsist in the natural world. Thus they advocate getting energy from burning trees or windmills so that evil fossil fuels can be left in the ground. 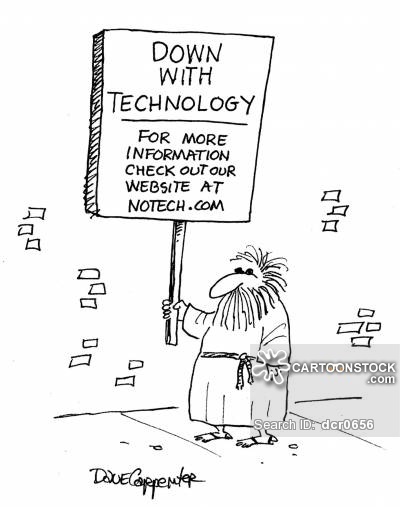 Now these Luddites want to turn back scientific progress in water purification, claiming that untreated water is superior. John Robson explains in the National Post article Raw water is proof the comforts of pampered modernity have gone too far Excerpts below with my bolds. In case you’re also in hiding from the insanity we call “popular culture,” there’s this new trend where you get healthy by drinking “naturally probiotic” water that hasn’t been treated to remove animal poop. No, I mean to remove essential minerals, ions and, um, animal poop. The National Post says people aren’t just deliberately drinking unhealthy water for their health, they’re paying nearly $10 per litre for non-vintage Eau de Lac. Yet they would riot if asked to pay such a price for gasoline or, indeed, to drink ditch water from their tap. Raw water is hardly the only fad to gain in strength, the more reputable opinion condemns it. And let’s face it; reputable opinion has dug itself a pretty deep hole with its propensity for disregarding evidence and silencing dissent. I don’t just mean in the bad old days. But there must be some kind of golden mean between believing every news story with “experts say” in the headline and refusing to vaccinate your children or boil your water. Seriously. 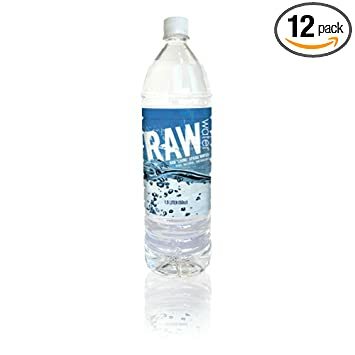 Raw water? Doesn’t everybody know if you must drink from a tainted source it is vital to cook the stuff first? Tea wasn’t healthy primarily because of the plant’s alleged medicinal properties. Boiling water to make it meant you killed the bacteria … before they killed you. My late friend Tom Davey, publisher of Environmental Science & Engineering, was routinely indignant that people could be induced to pay premium prices for bottled water when safe tap water was the single greatest environmental triumph in human history. But today some trendies are willing to pay premium prices to avoid safe tap water, partly on the basis of the same hooey about trace elements that made “mineral” water popular, partly out of paranoia once the purview of anti-fluoridation Red-baiters, and partly out of amazing scientific ignorance including about the presence of vital nutrients in food, especially if you don’t just eat the super-processed kind. There. I said it. Some of what we ingest is overly processed, relentlessly scientifically improved until it becomes harmful (a problem by no means restricted to food). But some isn’t, including tap water. I realize safe drinking water was hailed as an achievement back when mainstream environmentalists wanted the planet to be nice for people. Today’s far greater skepticism about whether human and environmental well-being are compatible creates considerable reluctance to make our well-being a significant measure of progress. But I am in the older camp. Without being insensible to the “crowding out” of ecosystems even by flourishing human communities, let alone poor ones, I still believe we can live well in harmony with nature, and only thus. Some conservative associates think my deep unease with factory farming requires me to line my hat with tin foil. Other people believe my support for conservatism requires me to line my head with it. But I can only fit so much metal into either, and I draw the line at deliberately drinking the kind of water that used to bring us cholera epidemics. Would it be impolite to cite this trend as proof that modernity has more money than brains, that the more a life of luxury is delivered to us as a birthright rather than being a hard-won and inherently precarious achievement, the less we are able to count our blessings or act prudently? By all means save the whales. Get plastic out of the oceans. Protect ugly as well as cute species and their ecosystems. Know that man cannot flourish cut off from nature, and weep at Saruman’s conversion of the Shire from bucolic to industrial in the Lord of the Rings. But you can’t do yourself or the Earth any good while dying of dysentery you brought on yourself by pampered stupidity. In 2015, 844 million people lacked access to even a basic drinking water service. These people, almost entirely from developing areas in Africa and Asia, are forced to play roulette by drinking water potentially contaminated with bacteria and viruses that cause diseases like diarrhea, cholera, dysentery, typhoid, and polio, as well as a variety of parasitic infections. Globally, a half million people die each year from diarrhea contracted via contaminated drinking water, many of them children. Another 240 million suffer from schistosomiasis, a parasitic infestation of flatworms originating from snail feces. Here in the United States, we generally don’t have to worry about waterborne illness. That’s because our tap-water travels through a rigorous system of mechanical filtration and chemical treatment which expunges contaminants, resulting in H2O that’s clean, refreshing, and among the safest in the world. 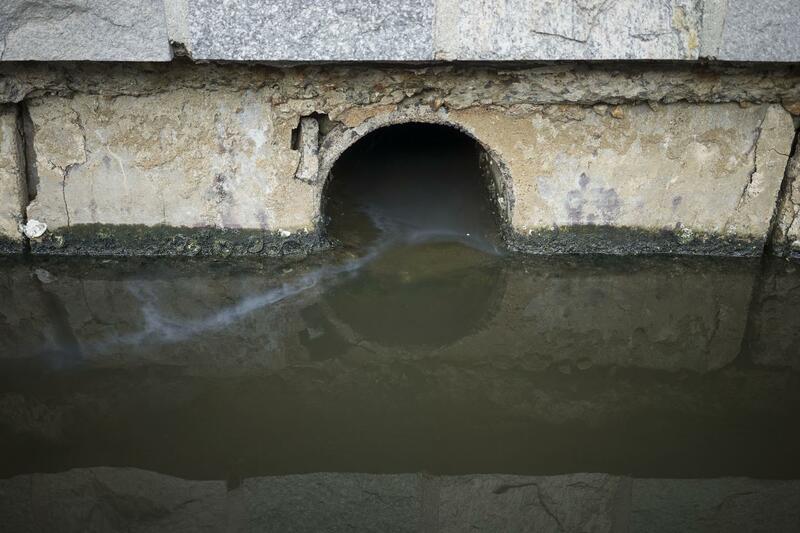 Raw water is insulting; insulting to the health of those that drink it, to the intelligence of those who consider it, and to the hundreds of millions of people around the world who yearn for treated water free from raw contamination.